The All Progressives Congress (APC), National leadership has said it does not have any court order against its candidate for the Ekiti State governorship poll, Dr. Kayode Fayemi. 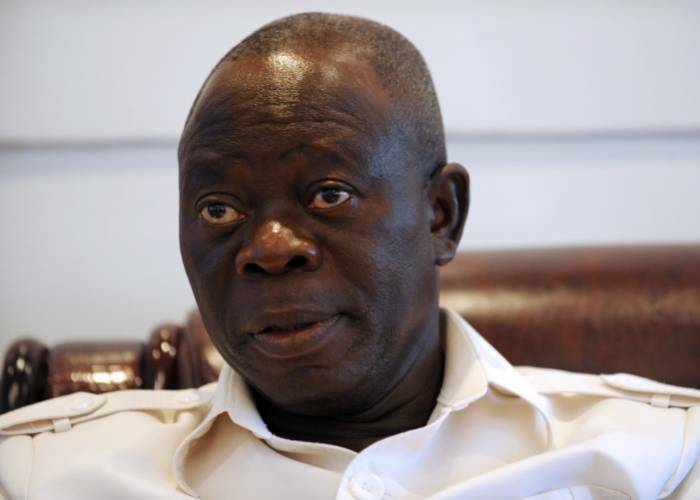 The National Chairman of the party, Adams Oshiomhole, stated this in Abuja, while fielding questions from journalists on the alleged court suit filed against the emergence of Fayemi by a former APC Deputy National Chairman, Engr. Segun Oni. There were reports that Oni, who came a distant second in the APC governorship primary had gone to court to challenge Fayemi’s emergence. Reacting to the reports however, the APC national chairman said the party was not aware of any such suit as no court papers were served to the party. “What is important is that Segun Oni spoke eloquently during the flag-off of the campaign. Segun Oni is a complete gentleman and I have a lot of respect for him. He spoke and I believe that he spoke from the heart. But in this business, you can hear all sorts of things on the social media. I am here as the National Chairman of the APC and I believe that if someone takes us to court, I would have been served court papers. “So, let me say that there is no such thing, but however, we know that the opponent can sponsor publications and try to plant confusion. The only hope they have is that we will turn against ourselves. “However, we are far more sophisticated than that and will not turn against ourselves, we are facing them squarely and this election will be lost and won on merit,” he said. The APC chairman further said the election is as good as won, alleging that the Peoples Democratic Party (PDP), rigged itself to power in 2014 using government’s funds. “We have a candidate who is not new to governance and he has his track records. We also know that in the last election that brought Fayose to office, how the election was rigged; the money collected from NNPC, the military officers ruthlessly deployed, the young officer that refused to participate in the misuse of the Armed Forces who later made a confession that was played on national television. “Those manipulative tools will not be used this time and so, the governor will have to learn an art that he was never familiar with. He has to learn how to persuade and convince the electorates. In line with the PDP tradition, they have always spent their energy on controlling structures and producing candidates whether people like them or not. “This time around, they will have to win and not to rig. I have fought PDP in Edo, just relying on mobilisation and persuasion and we know how to win. We will fall back on those conventions, tools of winning election and because they are not in that group, they cannot start learning new trick. So, Ekiti is as good as won,” he boasted. It will be act inordinate,calous & selfish ambition for Engr Segun Oni who has also served as the Gov of Ekiti State. To go to Court to challenge the Governorship Candidacy of Dr Fayemi whom he came distant 2nd to. During the APC primary election which produced Dr Fayemig as the Guber Candidate of their Party. he was defeated.My question to this corrupt ex-this,ex-that,politicians in Nigeria.Is, whether they felt indispensible that wtout occuping political offices,that their States of origin or,the Country as a Nation will colapse. After their corrupt & impunitive reign.Which contribut-ed to great extent, the present state of lack of Democratic dividends in the Country & presnt state of abject poverty by 75% of the Nigerian Citizens.In mist of abundant human & Natural resources. !